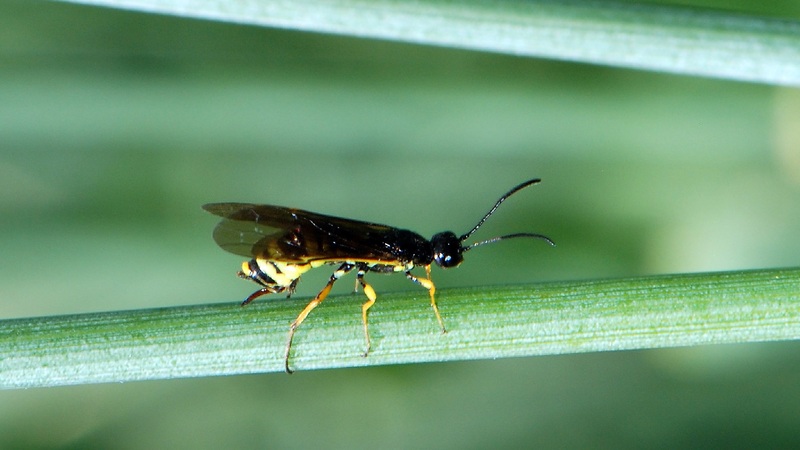 Though native to the Northern Plains, wheat stem sawfly has generally been a dominant pest in the west. Sawfly has been a key pest for many wheat growers in ND and MT, but grower reports have indicated higher populations of sawfly appearing in spring wheat fields in areas of northwest MN. While the potential impact of this pest on MN wheat is still unknown, we encourage growers to familiarize themselves with signs of sawfly. Egg: Pale, white eggs that are somewhat oval shaped. Eggs can be easily seen when the wheat stem is split. Larva: Newly hatched larvae are colorless and begin to turn a greenish yellow as they feed on the plant. Adult: Dark, slender wasp-like insect with yellow markings along abdomen. 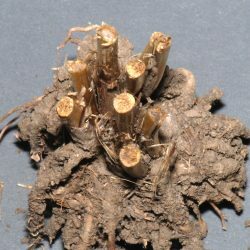 Look for lodged stems and stem cutting along field edges. Sawflies overwinter as eggs, and larvae emerge through May. Sawfly larvae burrow into the base of the stem, chew a notch on the inside and feed. Feeding weakens the stem until it eventually breaks. Sawfly drift to nearby wheat the following year, so infestations are usually more prevalent along field edges. Researchers are still in the early stages of understanding the potential impact of sawfly on the MN wheat crop. Researchers are asking growers to report any lodged stems or signs of the pest. Report any lodged stems and submit your information to Philip Glogoza or Jochum Wiersma at the University of Minnesota Extension. Though many solid-stem varieties are available in the west, new wheat varieties are being developed further east. AgriPro® brand SY Longmire is a sawfly-tolerant spring wheat variety currently in testing that may be an option for sawfly control in MN in the 2020 season.